On the record since 570 AD... Read more here on where we are, our history, a guide to various features of the area, facilities, religion, education, and some local links. See more with our photos and maps of the area and the always popular Virtual Tour. The Gazetteer lists local businesses and groups (quick-reference A-Z format by type of business or organisation). Suggestions and information are welcome at contact@raheny.org. Also of interest might be the Raheny Business Association site and Dublin City Development Board and Community Directory site. Why not add the site to your Favourites (or "Bookmarks"), either at this page or the Virtual Tour. And if this page is within a "frame" or appears to be inside another website's material, just click here. Within Raheny, much of two of the townlands form the area of Edenmore, which developed its own village centre during the 20th century. Neighbouring districts include Clontarf, a large district which once held an incorporated town, Killester, a small but ancient area whose church holds a relic of St. Brigid, Artane (previously Artaine), Coolock (more than half of north suburban Dublin lies in the Barony named for this district), Kilbarrack, and Donaghmede, formed out of parts of Baldoyle and Coolock and named after one of the local "big houses". Further afield lie districts such as Sutton, on the isthmus and city-facing side of the Howth peninsula, mythical and historic Howth itself, Baldoyle, Marino, Fairview and Beaumont. The nearest major industrial centres are in Coolock and Baldoyle. For much of the year, Raheny has its own long-running journal, Raheny News (the Green Paper), supported by the Catholic parish, which has also published a year-round weekly Church newsletter since 1997. The Church of Ireland Union of Raheny and Coolock issues a monthly bulletin and several other groups have newsletters. The area is served by two freesheets, the Northside People and Citywide News. Raheny has a number of residents' groups, who have also worked together in the Federation of Raheny Residents (FoRR). There is an active local business grouping, the Raheny Business Association (RBA). Other groups include a wide range of charitable, youth, social, leisure and sporting organisations. The local authority is Dublin City Council, with Raheny forming part of the City (County Borough) of Dublin. 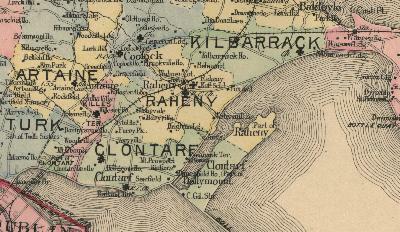 The boundary of the administrative county of Fingal, one of the three divisions of County Dublin, lies nearby. Dublin forms part of the province of Leinster, one of the five ancient provinces of Ireland (four remain today). Why is there no raheny.ie site, an obvious companion name? Irish registry rules are strict and official placenames are only available to the relevant local government authorities - the City Council holds raheny.ie and may someday develop local sites. Aside from country codes, such as .ie, many would use .com, .org or even .net for local / community sites. Unfortunately, all too often, these are taken and in use only as e-mail domains or for sale to local groups at high costs. There are firms who actively buy placenames for future profit. Good examples of this are all too easily found. This domain is held for local use only and is not for sale.